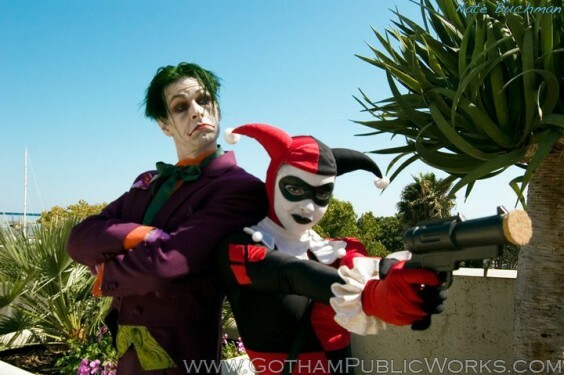 Since I’ve had a few people ask for some tips about cosplaying at San Diego Comic Con, I reached out to Tara Strand and she was nice enough to write this up for us! Hopefully these tips will help you with your first time cosplaying at such an exciting and overwhelming Con! Greetings, fellow con-goers and cosplayers! The first year I walked through the doors of a comic convention in a costume (SDCC, to be specific) was in 1999, and I haven’t missed a year since. I’ve definitely learned a thing or two over that time, and I hope some of the following tips will be of use to any of you who are just now beginning your journey into this same strange and magical world. I HIGHLY encourage you to make lists for just about anything! As you prepare your costume make a list of all the pieces you need to make, tweak, or acquire and budget your time accordingly. Make a list of everything you need to pack for the convention and enjoy peace and confidence as you pack the night away. Make a list just for your costume pieces that you can even follow as you get dressed so that you don’t forget that oh-so-crucial yet oh-so-forgettable accessory. Make a list of what you need to bring into the convention center so you have no last-minute dashes back to the hotel for your badge, money, or that life-saving medicine… You get the idea. And don’t forget to pack a lint roller! Keep a small bag with you that has any makeup you may need for touch-ups as well as quick-fixes for any costume malfunctions. A few good basics to keep are safety pins, double-sided tape (the kind they use for wigs and toupes), electrical tape, glue, a small sewing kit (with bonus tiny scissors! ), etc. Convention food can be pricey and hard to get to in the midst of the action, so you’ll thank yourself for having snacks and water on hand if you can. They’ve started to have food trucks outside the con which helps, but make sure you bring cash as not all of them accept cards. Gel insoles can be a life-saver in those less-than-comfy costume shoes. Gum or mints can help keep you pleasant to be around. If you can manage it, having a card with your contact info to exchange can be great as you meet people you want to keep in touch with, or to swap photos or video you took of each other, or get/give directions to that event later, etc. A pre-planned list of panels and events you want to hit can save you time and brain power. A camera! You will probably be sad if you don’t have one! More on that coming up. As you may be noticing, you’ll need to find a way to carry some stuff. The best option is a generous friend who will not only be your con-buddy and a big part of the fun, but who doesn’t mind schlepping along your con kit, reminding you to drink water, and grabbing items and handling a phone in a way you might not be able to in those slippery gloves you may be wearing. If you’ll need to carry around your own stuff (and sometimes other peoples’) plan to add a bag to your list of costume needs that you can usually turn into a character-suitable accessory! Have some. Make time for that refreshing shower, use that deoderant liberally, brush those pearly whites (after that morning cup of coffee, if possible), refer to a mirror, see the earlier note about gum or mints, and go out there and be delightful. Don’t forget about the whole reason you’ve gone to all this effort and play! Both you and other convention-goers will have way more fun if you are at least a little bit in character more often than not. There have been numerous times I’ve eagerly approached someone in a fun costume only to be disappointed by how unenthusiastic and civilian they seemed to be about wearing it. Bleh. Lots of people will probably want your picture, and it makes it way more easy and fun for all if you can strike a stunning (or even just satisfactory) pose at a second’s notice! Study the character and get at least a few solid ones down. Also make sure to practice in front of a mirror to avoid being disappointed later by pics in that pose or at that angle that was less flattering than you realized. And don’t forget the face! Keeping your face expressive or just your eyes alive with the character can make ALL the difference. Surely you’ll want to document your (and others’) costume and fun times, so make sure to bust out your camera often. On top of that, if you can make arrangements to meet up with a friend who’s a decent photographer to get some great shots in a more controlled area you’ll be VERY glad you did. Lately there are also a lot of professional photographers setting up times and locations just to get great cosplay shots, so keep an ear to the ground and take advantage. As referenced before, try to get the card of anyone taking your pic who looks like they have a great camera and knows how to use it. And last but not least, a post-con Google search is likely to yield some fun shots of you or other great costumes you might’ve missed! Snobbery happens, but don’t be the one to squander a rare gathering of so many like-minded people by either being judgmental or by letting yourself feel less than worthy. Appreciate the love and effort that you and everyone else has put into their costumes – whatever level that may be at – and that you’re all there to share in that and to have fun! So do that! Whoops! That got a little long and is plenty to start with, so let’s leave it at that for now. Plus now it’s plug time! You can catch me at SDCC on Sunday at the panel Full-Time Creative Work on a Part-Time Schedule (4:00 – 5:00 PM, Room 24ABC), and Saturday on the exhibit hall floor dressed as pregnant Harley Quinn with my baby’ daddy as Dr. Daddy Joker! For more costume-related chat I also co-host the CosCast on Nerd Reactor (nerdreactor.com), and I try to answer questions on the facebook page for my Batman group, Gotham Public Works (http://www.facebook.com/gothampublicworks). I can hear the music playing me off, but while you’re on facebook check out our page for the upcoming webseries Batgirl Spoiled (http://www.facebook.com/BatgirlTheWebSeries). I really think you’ll love it! Ok, bye! !